Dakshin Foundation works in a mosaic of land- and seascapes that are at once social, ecological and political in nature. These biologically and culturally assorted ecosystems have often remained on the margins of mainstream development and environmental governance. However, especially in the case of our coasts, they are fast emerging as the new frontiers of activity and industrialisation, and are fast becoming areas of considerable social and ecological strife. The operation of the dominant paradigms of conservation and development has contributed to the severance of delicate relationships between humans and their environments at varying scales. These paradigms have also fuelled the alienation between people and their environments even in biologically rich landscapes, often through violent means such as displacement, industrialisation, mechanisation and environmental degradation. 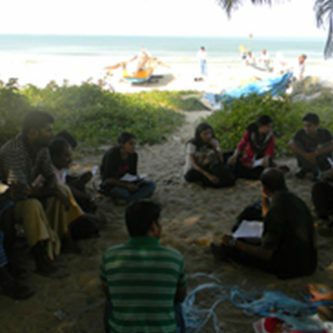 Combining our skills in the disciplines of the natural and social sciences, Dakshin’s approach towards understanding and addressing these environmental problems involve intellectual and practical engagements with social, political and institutional change. Though a combination of research and advocacy, Dakshin members strive to understand and effect positive change in these complex systems.